I'm always looking for something different to cook for dinner. I recently came across this recipe and deleted the bacon and added Field Roast Apple Sage Sausage (www.fieldroast.com). Craig not being a meat eater, they make an incredible alternative to the traditional pork casing cousin. Typically, I'd make this for "meatless Monday", but today seemed appropriate. I hope you take this recipe and make it your own. Maybe add bell peppers, mushrooms, bacon....whatever you like. Give the zucchini a quick wash for good measure. Slice in half lengthwise. Leave the ends on to keep the filling in. Scoop out the flesh with a melon baller or back of a vegetable peeler. 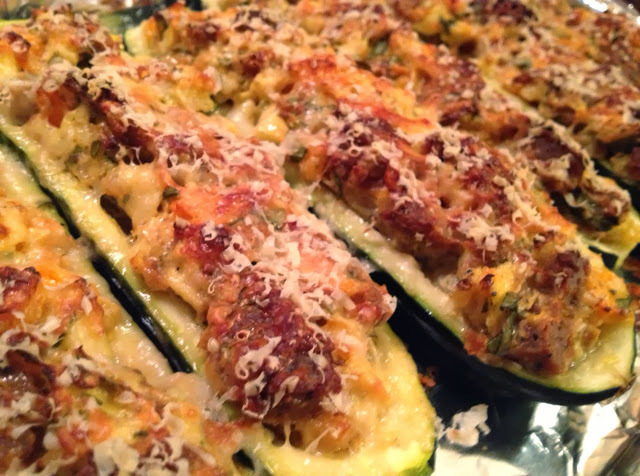 Leave a ledge of zucchini around the edges. 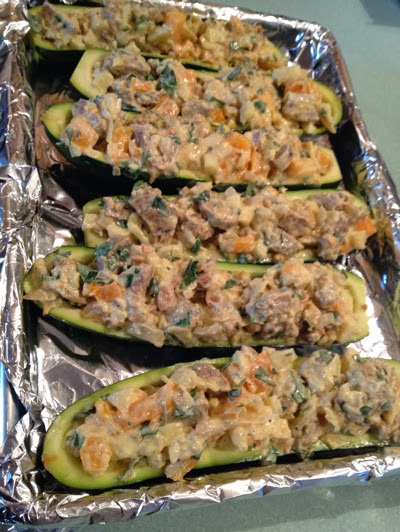 Arrange the zucchini boats in a baking dish. 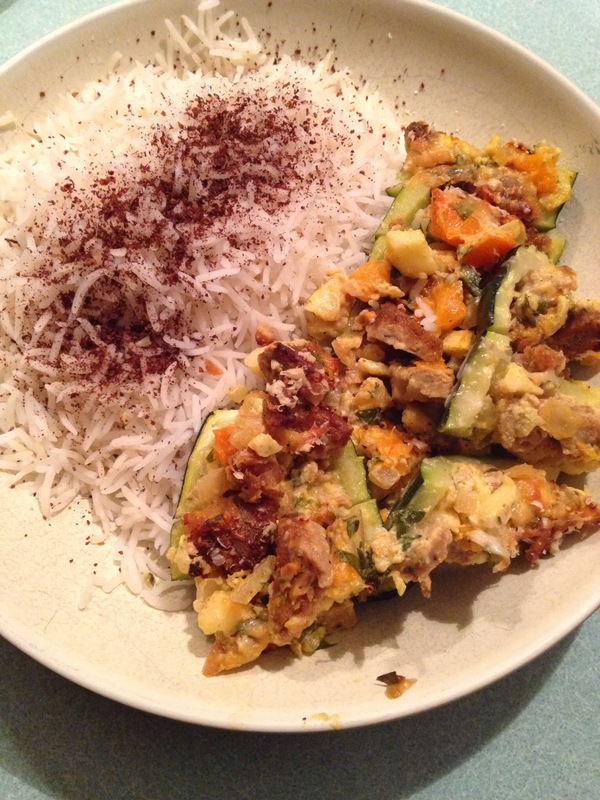 Chop the zucchini flesh as small as you like. Finely chop half a sweet onion. Chop up Field Roast sausage. Add the curry powder... cook until desired doneness of onions and remove from heat. 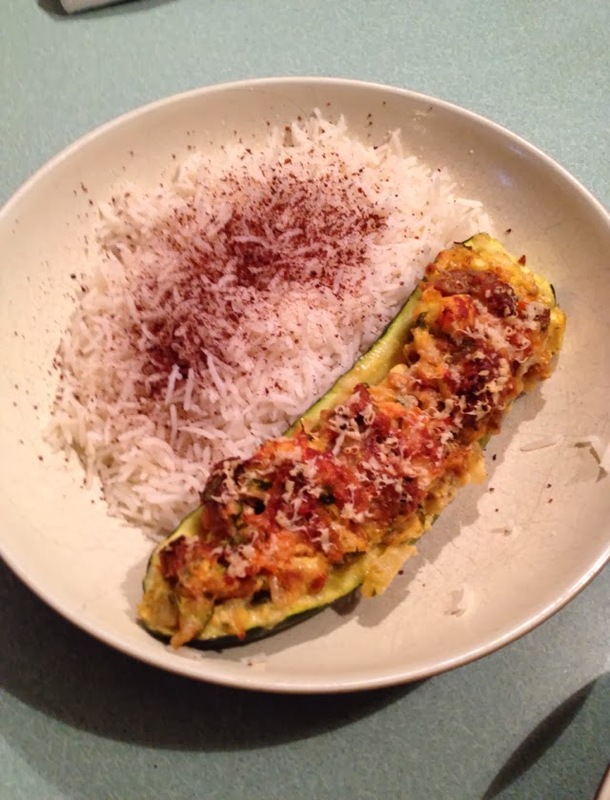 To the zucchini flesh, add sour cream. Rough chop some fresh thyme leaves. Mix onion and sausage mixture with other ingredients. Taste and adjust seasoning. Stir in the tomato. Seed them or else there may be too much moisture in the filling. You don't really want the filling to be all runny when you cut into it. 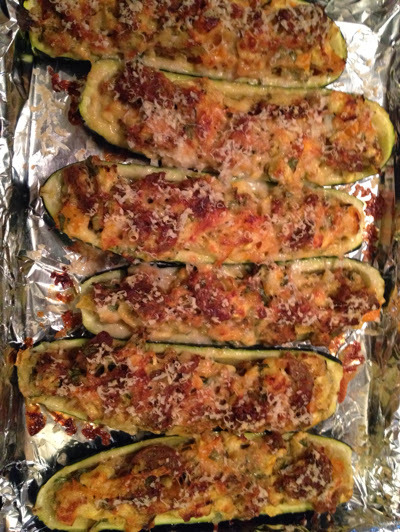 Refill the zucchini shells with the filling mixture. Grate some good aged Goat cheese on top and sprinkle with fresh cracked black pepper. Bake uncovered at 375 degrees F for 30 minutes. Of course you know me. I'm gonna grate even more cheese on them again.